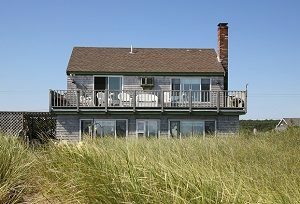 From Salisbury to Cape Cod, Massachusetts has a lot of beautiful places for beachfront property. And while these locations provide vistas and opportunities for sea-side access, these properties can also pose unique problems when it comes to landscaping the areas. In this blog, we’ll look at the common issues that can arise when it comes to beachfront plant installations and landscape construction, as well as stopping larger landscaping issues on beachfront property before they can turn into disasters. Many normal plants are sensitive to salt, exposure to which can stunt their growth or even cause them to wither and die. If you’re close to the ocean (rule of thumb is around an eighth of a mile or under 200 meters), you need to invest in salt-resistant plants. For many customers, we recommend installing native plants of the New England coastline. Not only will these plants stand up to salt, but most require less maintenance and are drought resistant, perfect if your home doesn’t see use (or maintenance) year-round. Beachfront houses are designed around being resistant to the elements, important when you’re exposed to more sun and storm conditions than homes further inland. Make sure to pick plants that are not only going to do well in the light (or partial shade if adjacent to your home or outbuildings), but also are going to be okay in high winds and rains. The same is true for any landscape construction you do. When hardscaping, make sure to plan for storm conditions. Being so close to the ocean and with as much rain as you will receive, it’s important to plan to avoid runoff from your home contaminating the ocean and other biomes like nearby wetlands. Like we explain in our blog, Chemical-Free Yard Care, it’s important to avoid chemicals harming your children and pets, but also to avoid runoff contaminating the area around you – there are no storm drains. Think about creating wetlands or other drainage buffer zones to help avoid disturbing the natural ecosystem – this also includes working with more water-porous materials and designs when it comes to hardscaping. The last concern for beachfront property is soil erosion. Homes built near the ocean and on bluffs are very susceptible to this. When looking at landscaping, talk to your contractor about comprehensive plans they can make to avoid the edges of your property from shrinking or putting your home in danger. Often, a combination of native plants, retaining walls, terraces, and other landscaping features can help control the water flow – and therefore soil erosion – of your home, all while making it look fabulous. A home by the sea can be a wonderful thing, either as a full-time dwelling or a second home in the summer. Make sure that it doesn’t only look beautiful year-round, but also that its landscape is protected from the elements. Looking to make your seafront property thrive? It’s time to contact Greener Horizon. We can help you build and maintain beautiful seaside property, even when it comes to larger estates.